Alzheimer’s was a part of my life even before I spoke my first word, took my first step or even opened my eyes for the first time. My grandmother developed early onset Alzheimer’s before I was born. When other little girls were being doted on by their grandmother, I was helping my mother to care for mine. She lived with this horrible disease for nineteen years and I watched a piece of her slip away day by day. Later in life, this memory stealer attacked my beloved aunt and just a few years later, my Mama, and then much later two uncles. Watching all of them change from the loving kind people I had known into strangers was very painful. Today, I am facing this stage again with my mother and father in law. It makes me sad seeing my husband endure the pain of seeing his always independent, smart and funny parents change each day. I walk so hopefully, my children and their children do not have to endure the enormous strain it puts on seeing your loved one slip away little by little. The stress of being a care giver also takes its toll on you and your loved ones. I walk so caregivers have a place to vent, to cry and a friendly shoulder to lean on. I walk to insure that there are funds to provide help and insight. When you reach a point when you need someone to lead you in the right direction, Alzheimer’s Association is there. I walk so they can continue to be. There is no cure for Alzheimer’s Disease. It’s fatal…..Yet I am a survivor of this horrible illness. How can that happen? A miracle? I just said that there is no cure. I’m not sure when I first noticed the symptoms. It was actually several years before the diagnosis. It took a long time to get the devastating news, since there isn’t a definitive test that could give me the answers I so desperately sought. Why couldn’t I find things? Why didn’t familiar foods taste the same? Why were colors of clothes not quite as bright as they once were? Why did everything in my life seem to be changing so quickly? Why was I so tired? I didn’t sleep well at night. Why did it seem as though I cried all the time? I was so depressed. I had bruises on my arms that I could only explain to a select few. I went to church and I prayed for a cure. My family prayed and went to many doctors with me. I felt as though I lost everything…..my life as I had known it for over 50 years, my freedom, my home, my joy…and at times, my God and my faith. The cure may be just around the corner…..just over the next horizon. That’s why I’m at this event today. We need to band together. My walk for a cure began years ago. It was my mother who had Alzheimer’s. It was in my parent’s home that I could not find things. All of a sudden things were disappearing from their usual place. Mom didn’t know where the salt and pepper was even though it had been kept in the same place for the last 58 yrs. Her mashed potatoes didn’t taste the same, because she left out the salt. My parent’s clothes started changing colors because she forgot to separate the colors from the whites. Sometimes, she forgot to use laundry detergent. The bruises on my arms were from my mother’s grip when she was angry with me…..because I wanted her to eat, drink, shower or go out for an afternoon ride in the car. They were simple, everyday things in life, but terrifying to her. My mother, father, brothers and I desperately sought medical answers to a disease that has no blood test or single x-ray to diagnose. I was her primary caregiver. My 85 year old father and I cared for her for many years. We were both exhausted. Caregiver’s roles don’t end at 5pm or even 11pm. It is an all day, every day role…..until the end of life. I was sleep deprived, sad, depressed and longed for the time when life would return to “normal” for my mother & our family. We learned to live a “new normal” every single day. 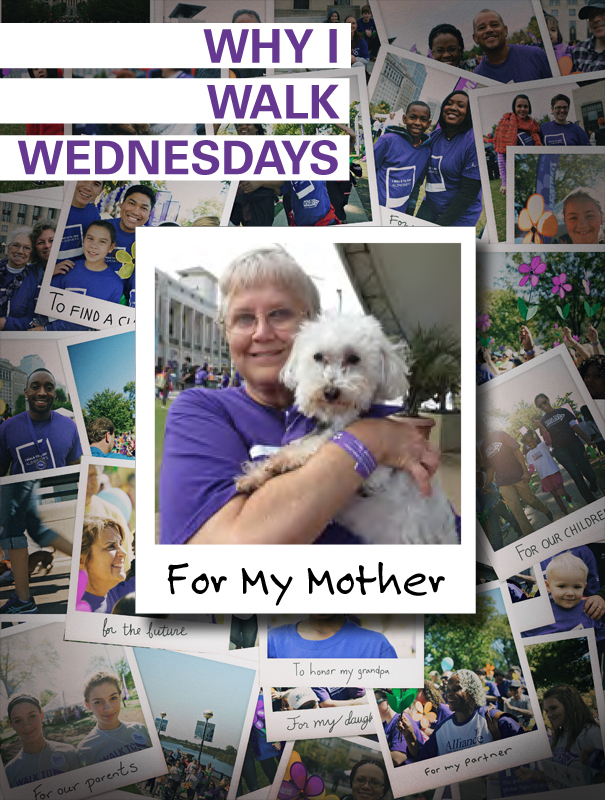 My life changed forever the day that my mother was diagnosed with Alzheimer’s Disease. It changed the lives of our entire family. We lost my mother, Kay Hastings, on Oct 3, 2009. I was holding her hand. Our family had gathered to say our goodbyes that afternoon….. we knew that she wouldn’t live much longer. My dad was experiencing the saddest event in his life. He was losing the love of his life, his Sweetheart of almost 60 years. She was a wife, mother, grandmother, aunt, nurse & much more. Dad died in Dec of 2010. I am learning to live life at a different pace, love & laugh once again. I sing, swim, smile, volunteer, teach & nurse. I have learned to ride a horse & a jet-ski and enjoy new adventures in life. I received my Master’s degree in patience. Research, Education & Support …..helped me Survive Alzheimer’s Disease. It’s hard to imagine but Alzheimer’s disease has been a part of my family for over 17 years. My grandmother, Annie “Jo” Ward, was the first to be diagnosed. She was an amazing woman with many talents who loved to stay busy. My grandmother would sit for hours, at the kitchen table, working on crossword puzzles. She also loved to work in her yard. Eventually, Alzheimer’s robbed her of being able to do either of those things. She was a great mother who loved her children and grandchildren deeply. Alzheimer’s robbed her of the ability to recognize those she most loved. When she passed away a little over two years ago, she was bedridden and unable to communicate. Sadly, a few years ago, my father-in-law was diagnosed with Alzheimer’s disease. His decline has been quick and he is currently being cared for at an assisted living facility. It saddens me to know that our family will once again have to experience “the long goodbye”. One of the worst aspects of dealing with Alzheimer’s is the feeling of helplessness. That’s where the Walk to End Alzheimer’s comes in for our family. There was little any of us could do for my grandmother and very little we can do for my father-in-law. But, we can WALK! 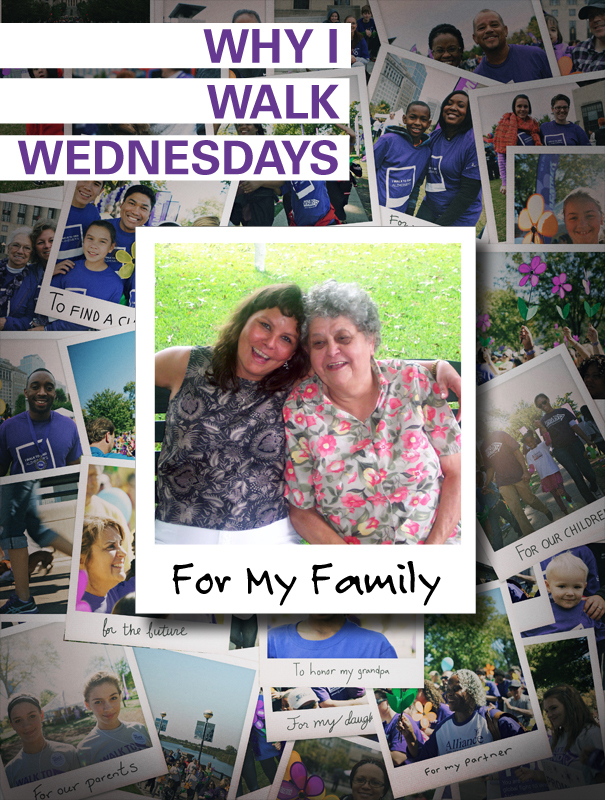 We can walk in memory of those we’ve lost and in honor of those living with the disease. We can raise money to support the programs of the Alzheimer’s Association. 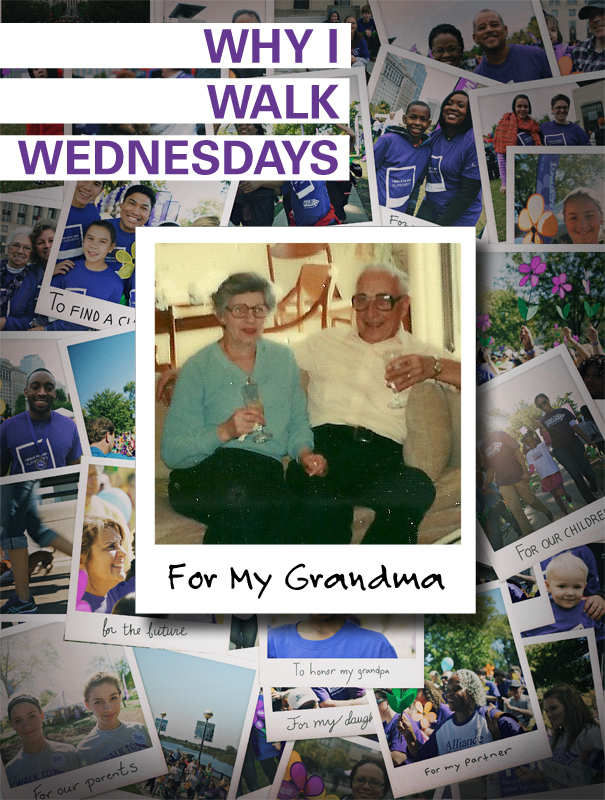 We can walk in support of research that will one day provide treatment and a cure for Alzheimer’s disease. We can walk because it gives us hope. My name is David Lamb. 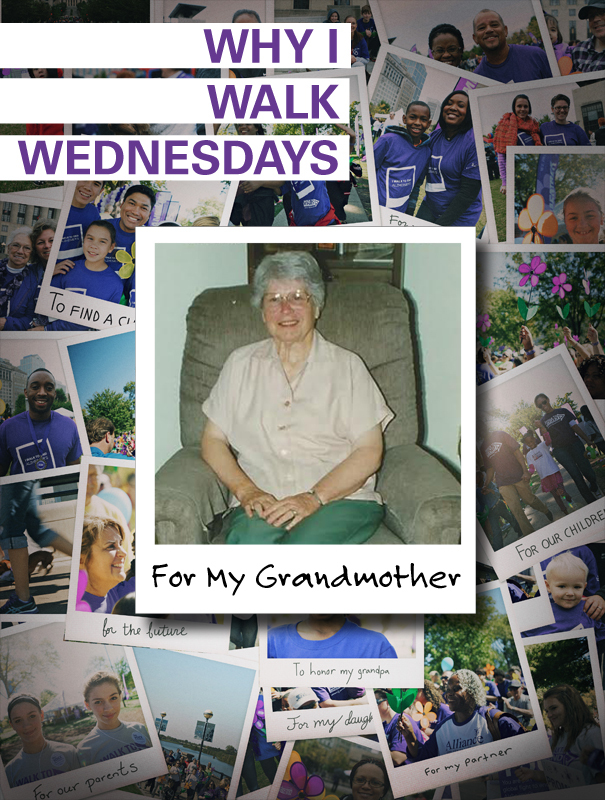 I walk in memory of my Grandma Octavia Josephine Lamb who was diagnosed with Alzheimer’s disease and passed away from the disease back on January 26, 1998. I also walk in honor and memory of my great Grandma Ina Agnes Howard and my great Uncle Larry Howard, both of whom passed away from Alzheimer’s disease. Alzheimer’s disease took a significant toll on my Grandma, she went being able to remember everything, to labeling items that were placed around the house, to ultimately becoming a vegetable in bed in which she could no longer walk or talk. But as anyone who has dealt with a loved one that has Alzheimer’s, the disease just doesn’t affect one person, it affects many. Upon my Grandma’s diagnosis my family took over the role of being her caretakers. We went from taking care of her ourselves, to having an at home nursing assistant care for her, to moving her to a family run nursing home, and to ultimately a 24 hour skilled nursing facility. There’s simply not enough words in the dictionary to describe the emotional and financial toll that my family endured. Today, I volunteer with YAAA! (Young Adults for Alzheimer’s Awareness), to bring more awareness about the disease and its devastating impact and in hopes of one day that we can find a cure so that we can all see a world without Alzheimer’s. My Grandma Octavia Josephine Lamb and My Grandfather.